Kiss My Wonder Woman: Guardians of the Galaxy. Worth It. Guardians of the Galaxy. Worth It. This isn't going to be a long review, or a particularly complex one either. I can sum it all up right here: Guardians of the Galaxy is great. You should watch it. The end. Yeah, so, I saw the movie last night, surrounded by my friends and family, and I wasn't precisely what one could consider an impartial judge. I've been excited for this movie since it was announced, and even knowing that James Gunn (a director I'm not super enthused about) was attached, or seeing the trailer and all those long, lingering shots of Zoe Saldana could quite persuade me not to be hella excited. I'm glad I wasn't dissuaded, because the film did not disappoint. From the acting to the writing to the stinking art direction, the movie was spot on. It's no Captain America: The Winter Soldier, sure, but it's not trying to be. It's a fun action movie about superheroes and space and hijinks and epic battles. It's the kind of movie where the hero can save the day, and be a snarky jerk the whole time doing it. In other words, it's super duper entertaining. The basic plot (very, very basic) is that Peter Quill (Chris Pratt) is human who was abducted by aliens when he was a little boy. The aliens raised him and trained him to be a "ravager" like them - a thief, basically - and he's kind of an all around likable scuzz-ball. His latest mission is to retrieve this orb thing from a dead planet. He does, but he has to fight for it, because it seems his bosses aren't the only ones who want the orb. Actually, everyone wants the orb. 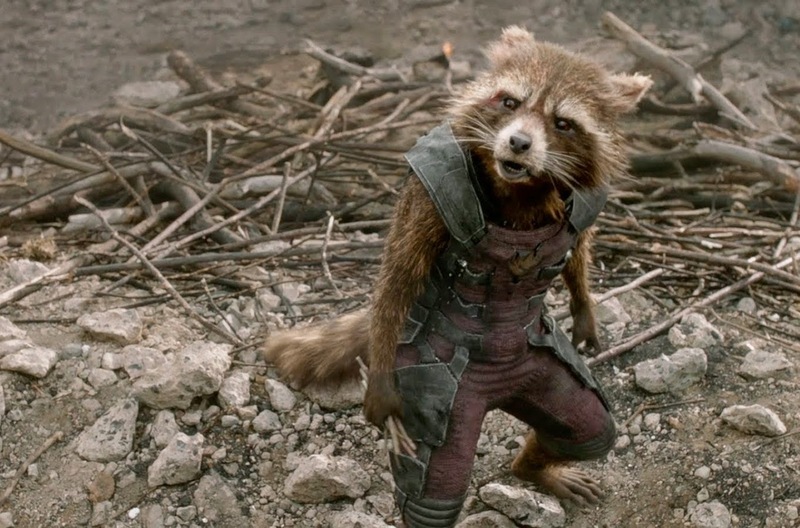 Peter manages to make a break for it, but pretty soon he's being pursued by half the galaxy: his old boss who he's trying to rip off, Rocket Raccoon (Bradley Cooper) and Groot (Vin Diesel) who are after the reward they'll get for turning Peter over to his old boss, and Gamora (Zoe Saldana), a lethal assassin working to retrieve the orb for her boss, Ronan (Lee Pace). Just in case that's not complicated enough, Ronan himself is only trying to get the orb so that he can give it to Thanos (Pierce Brosnan), who happens to be Gamora's adopted father. Got it? Yeah, well, don't worry about it. The movie is aware of it's own deeply complicated plot, and while the first twenty minutes or so are very exposition-heavy, they're still fun. You get through it. Our heroes all end up tossed in jail together, and band up to escape, hoping to sell the orb to the highest bidder and split the profit. They also pick up Drax (Dave Bautista), a stereotypical tough guy who thinks that by sticking close to Gamora he'll get a chance to kill Ronan and avenge his wife and child who were murdered blah blah boring backstory. Sorry, not to seem callous, but Drax' backstory is hands down the laziest part of this movie. It's too easy. Overall, though, the movie is an absolute freaking delight, and it's hard to call any part of it overdone or half-assed. It's just right. The humor is spot on (a friend commented that there's at least one amazing one-liner every five minutes - I'd put it closer to three minutes), the effects are impressive, and the story is cool and engaging. All of the characters get their little moment of understanding and emotional development, even Drax (though his is a bit dull). More than that, all of the characters, even the non-leads, feel like fully realized people, for all of their alien-ness. Peter Quill is obviously the best developed, since he's our lead, but that doesn't stop the others from being pretty interesting too. Rocket and Groot have a genuinely beautiful relationship, and are each characterized with surprising depth and humanity. Drax has little quirks and tics that make him really fun despite the bleh backstory. Gamora has a general disdain for everything happening around her that I find quite nice. They're all people, and they're all complicated, and the movie doesn't try to make that easier on you. Which is great. The cast in general is lovely. Lee Pace does an excellent job thundering and glowering as the Kree terrorist Ronan, a genocidal maniac who has trouble thinking outside the box. Karen Gillan is positively vicious as Nebula, another of Thanos' "daughters". Her relationship with Gamora is complicated and twisted and a really great addition to the movie. Props to the writers on that. Glenn Close and John C. Reilly are fabulous as the leader of the planet Ronan wants to blow up and its chief ranking police officer respectively. Benicio Del Toro is fantastically creepy as The Collector. Djimon Hounsou adds a lot of depth to his henchman character. Just generally? The actors are knocking it out of the park. If you've noticed that this review is largely about surface stuff, then you're right. It is. Guardians of the Galaxy is super fun, but it doesn't have a whole lot going on metaphorically speaking. I mean, that's not a terrible thing. There isn't a whole lot of philosophical depth to this story, but that doesn't make it bad. No, in complete contrast to last week's Lucy, this is a movie that know precisely how ridiculous it is and positively revels in it. This is a movie that's just rolling around in a pile of ridiculousness and inviting you to roll with it. There are Kevin Bacon references. Peter Quill challenges someone to a dance off. Nathan Fillion cameos. The Russian space dog shows up. Groot. 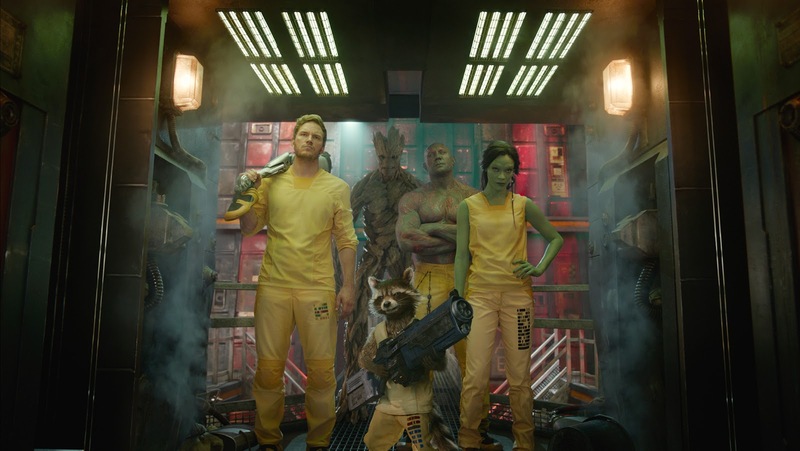 Guardians of the Galaxy isn't a deep movie, but it's not trying to be a deep movie. What it is, more than really even feeling like a superhero movie, is Star Wars. It feels like Star Wars. It's fun science fiction that doesn't really worry or care about how the science works, it's just here for the ride and the fun and the awesome characters. Peter Quill is very clearly Han Solo, sure, but what I'm getting at is the tone here. The tone is very "here's a giant universe full of weird stuff - let's explore!" And that's a very compelling tone. I do have a couple of quibbles (Gamora is relegated too much to the love interest role and would be more interesting on her own, Nebula was under-used, Peter didn't have to be a womanizer, etc), but the real takeaway here is honestly that this movie is really and truly fun. And there are so many reasons to love this movie. Like, it's the first Marvel movie to be credited as written by a woman: Nicole Perlman. Or how its main cast is incredibly racially diverse (for a superhero movie). Only two of the leads are played by white actors. Yay diversity baby steps! 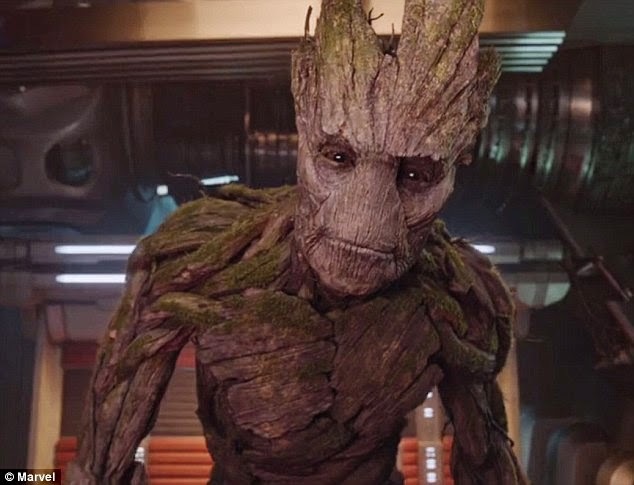 Also, somehow Vin Diesel manages to completely steal the show, and give the most compelling performance of his career while only saying "I am Groot." I'm not even kidding. He's the real star of the movie, and it's amazing. The real upshot of this movie comes down to this: do you like fun things? Then you should go see Guardians of the Galaxy. Because if we want more science fiction that's weird and wacky and fun and cool, then we need to spend money on the properties we get that are weird and wacky and fun and cool. And also Groot. I too missed the Nathan Fillion cameo. But I'm still the only person I know that pointed out Lloyd Kaufman of Troma cameo at the very beginning of that scene. It's so blatantly campy, I would be worried if his ugly mug wasn't front and center. Dang, I missed that one! But I love the level of cameos in this. Much needed camp. 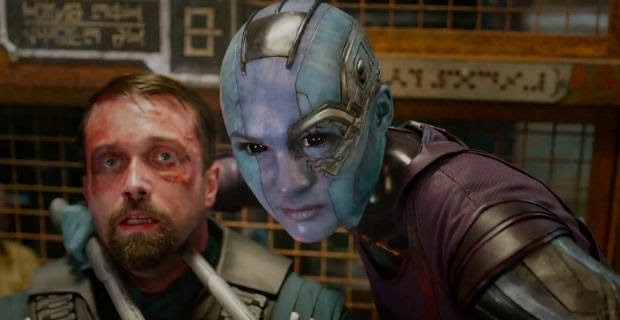 Karen Gillan is positively vicious as Nebula, another of Thanos' "daughters". 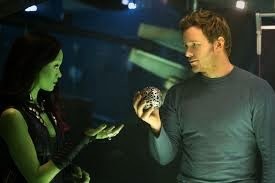 Her relationship with Gamora is complicated and twisted and a really great addition to the movie. Props to the writers on that. It also means that when Gamora gets the "chick fight" that the lone female protagonist in action flicks tend to get, it's a fight that resolves her arc with her quasi-sister. It had to be Nebula who Gamora got her win over, and it had to be Gamora who got the win over Nebula - both character's stories demanded it. A culmination rather than a relegation. (I do get the impression Nebula survived, which makes me wonder what she'll do now - she has to figure that Thanos will realise she turned on him - which means if she shows up again, it'll be as a dark wildcard. Which is kinda cool). I am reasonably sure that Nebula survived, and I assume we'll see more of her in the coming films. I like that she was so unpredictable, and I really like that she's the rare female villain who's not sexualized, but also not minimized. She's just threatening and unpredictable, and has motivations that baffle even her closest friends. I love it. And also yes to all of your points about Gamora *needing* to fight Nebula. I hadn't seen that, that's interesting! Personally, the not understanding metaphors thing is the best part of Drax. The part I dislike is how stereotypical the rest of his backstory is. I mean, he had pathos, a great actor, awesome character development, but "I hate him because he killed my wife and child?" It's literally the most common heroic backstory for a male character bent on revenge, and it's such lazy writing, you know? Also yes. All hail Groot! At a Wedding, Carry on Without Me!